We know how valuable your saw blades are to you. That’s why we treat them with the utmost care — and why countless customers have trusted us for over a century. W.D. Quinn Saw Co. is one of the oldest saw blade sharpening companies in the country, and among the most technically advanced. Since 1903, we’ve placed history, technology and passion into our work, consistently providing saw blades that work exactly to specification, every time. 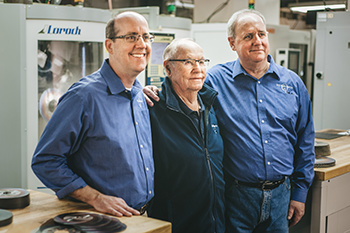 Today, we’re a fifth generation family-owned and operated company, and we’re still committed to supporting our customers with blades that work better than they ever could have imagined. While we’ve always stayed ahead of the saw sharpening game with technology designed to achieve the highest speed and precision possible, the true Quinn Saw difference is our human touch. Our team members can identify the shape of a single tooth the moment they look at it, and they know how to calibrate our machines to ensure every blade that passes through is returned to the customer better than new. Around here, we like to say that you learn to sharpen a saw blade by sweeping the floor. Our team members start at the bottom and work their way up until they’re able to offer the precision, knowledge and experience that our advanced sharpening machines demand. Quinn Saw employees have a stake in the success of every single grind, and that commitment is the reason we consider them a part of our family. Modern tools for modern blades. In Quinn Saw’s earliest days, we filed everything by hand. The introduction of mechanical, gear-driven machines was followed by the arrival of single-motor machines with grinding wheels. Eventually, complex electric motors changed the game, allowing us to sharpen our customers’ saw blades automatically. As the technology became more complex, the possibilities and precision grew. And we were there every step of the way. With Germany at the forefront of saw sharpening, we’ve made a habit of visiting their biggest trade shows to discover the latest innovations. We’re the first to see these advances, and we aim to be the first to provide them to customers across the United States. William D. Quinn founds the W.D. Quinn Saw Company in a small shed in St. Louis, Missouri. Business prospers as the city prepares for the 1904 World’s Fair. Quinn Saw continues to build its reputation by meeting the saw blade sharpening needs of the lumber and furniture industries. Quinn Saw expands into metal cutting during WWII, supplying saw blades to the defense industry for everything from ordnance to shipping containers. As the post-war home building industry booms, Quinn Saw grows with it by offering its expertise to window, plastic and aluminum manufacturers. William’s daughter Dorothy takes over the family business. Quinn Saw gains extensive cold saw expertise as the blades rapidly grow in popularity. Quinn Saw begins to work primarily with high-volume, high-precision manufacturers in the appliance, medical, aerospace and automotive industries. Now in its fifth generation of family ownership and operation, Quinn Saw continues to celebrate its past while looking toward the future.